Fifty Year Olds Shouldn’t Jump Up and Down for Two Hours | Ooh Something Shiny! Ouch! But how do you resist at such a great concert. Suburban Legends, Big D and the Kids Table, Goldfinger and Reel Big Fish at the Town Ballroom. Any one of these bands is worth turning up for, but the four together made a really powerhouse show. 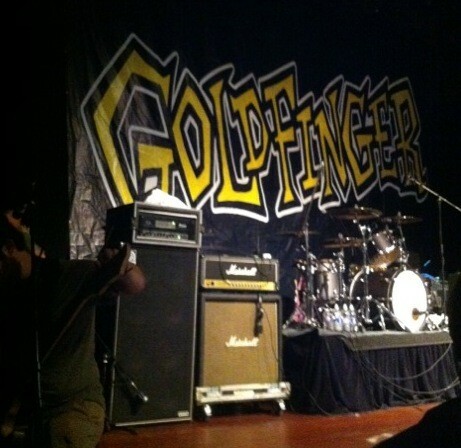 I had seen every one of these bands live except for Goldfinger and I was really excited to see them.I quickly claimed a spot in the front, up against the barricade. It was a capacity crowd and hot as anything. I was covered in sweat, some of it my own, but I didn’t dare give up my prime spot to get a drink. Suburban Legends and Big D were high energy as usual and funny and engaging at the lobby merch table. One of the prime advantages of smaller venues over arena shows is the ability to mingle and chat with the talent. Goldfinger’s set began with lead singer John Feldman surfing out into the crowd, still singing while buoyed on the hands of his fans. He returned to the stage and brought out his family. For such a profanity-laced performance performance, it was pretty family oriented. Nothing but water on the stage (Big D had water too, but plenty of PBR as well), lots of local attention for Buffalo native, drummer Darrin Pfieffer. Bassist Kelly LeMieux turned the video camera back onto the audience and asked the crowd to wish his stepfather a Happy Father’s Day. Feldman asked who had been following them since their beginnings in ’94 and owned their self-titled album and invited a dozen or so audience members who raised their hands onto the stage to sing along. Goldfinger encored with 99 Red Balloons and made way for the headliner, Reel Big Fish. RBF entered to the Star Wars theme and launched into their brand of brass-heavy high energy ska that we know and love. My next concert I have lined up is Warped Tour at Darien Lake. None of these bands will be there unfortunately, but Streetlight Manifesto will be, another must see ska band.